Gillian Lee Smith: Tis done! i love your work and the new site is wonderful,(easy to work thru),congratulations! if i were to win i would so like to have the print of "feeling empty inside". It is very easy to navigate, simple to follow, and looks very good, with clean lines and relaxing colours. There are two things, one of the pictures "Hermoine" isn't working for me. I can see her details and the link only. Also, just a personal thing, but the front pages pictures of each menu item, maybe you could centre them, they feel a little to the menu side...just my aesthetics. hi gillian, i am a bit of a lurker here but i wanted to chime in today to let you know how much i love the new website. i agree with the comments above-the colors are soothing and the site was easy to move through. one question---what does c.v stand for? 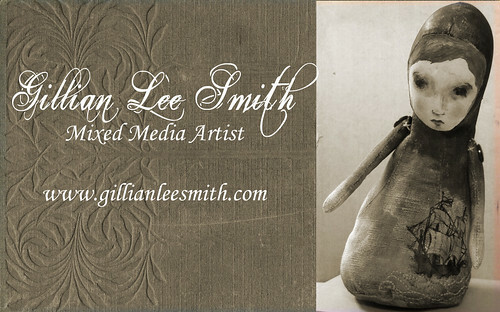 Gillian, I think your website is beautiful and I love the embossed design like an old book. The only thing I would add is the size of prints or dolls but if your linking with your shop I guess you would find out that info there. If I was lucky enough to win I would choose your print "The Chambers Within"
Hello Dear Gillian! Congratulations on such a lovely new website! And it was sooo nice to get to see the pretty face that goes with the pretty artwork that I lust after. I never win anything so I won't say what I'd like to add to my collection. And besides... who could choose between them?! Hope the site brings you all you dreamt and more. Your art is amazing...the face of your art doll tells a story, I love that. I will be back often to see your beautiful, talented, inspiring work. Your new website is lovely! Clean and easy to navigate. I love the new look of your marketing materials and this blog. I haven't had a chance to stop by in a while...and was pleasantly surprised! Hugs to you!